The Verandas at Mitylene features 332 units spread across nearly 23 acres and 14 well-laid out three-story buildings. Built in 2007, the property features eight unit types with spacious floor plans; one-bedroom / one-bath, two-bedroom / one-bath, two-bedroom / two-bath, and three-bedroom / two bath units ranging in size from 845 to 1,394 square feet. 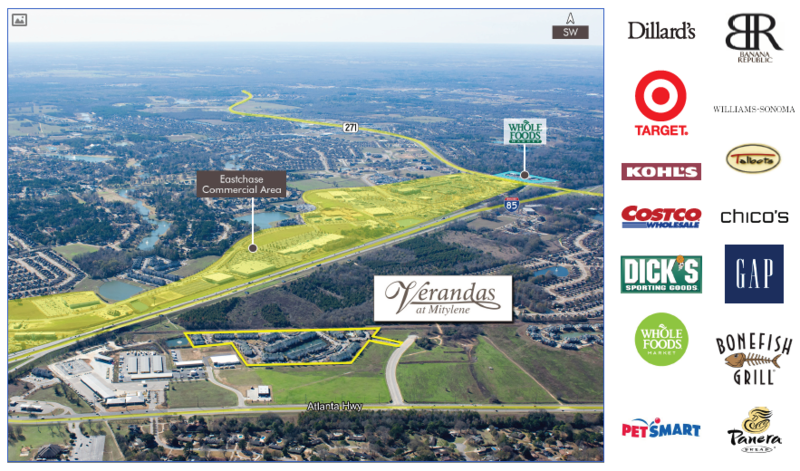 The property is located in Montgomery’s most desirable submarket extremely close to the “Eastchase Area” featuring over 2.0 million square feet of retail and commercial space – the largest concentration of retail, restaurant, hotel and upscale shopping in the greater Montgomery area. This upscale mixed-use area extends along the south side of Interstate 85, between Taylor Road and Chantilly Parkway, only minutes from the property. This area also features numerous office and medical office uses and residential development.